Selecting a new school and daycare facility is all-important for families who are facing a move. 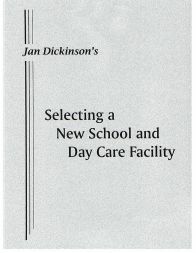 This book details concerns and questions that need to be asked before that selection is made, and will guide you to a successful selection, and provide help getting the children moved and settled into their new surroundings. It is used by school districts to guide creation of brochures to provide answers.